There are two 4" woven baskets held together by a vegetable tanned leather strip, with a colorful wooden slice and ball. 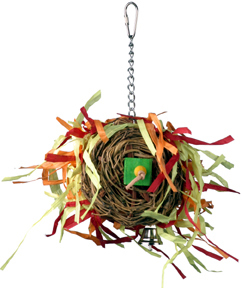 There is colorful shredded paper inside and a bell on the bottom for a ringing good time. This fun toy is hung from a nickel plated welded chain, topped with a nickel plated pear shaped quick link for easy hanging. Good toy for your small to mid sized beaks! Be sure to use your imagination and add some goodies inside the woven baskets to encourage foraging behaviors.